Divi is a great platform to build a portfolio to showcase your work. It can be a website that includes your portfolio or the site itself could be the portfolio. It doesn’t matter if the portfolio showcases projects, art, or photography, they can look outstanding in Divi. You can add a portfolio to your Divi website using the portfolio or filterable portfolio modules, or you can even build them using a gallery or image module. Another option is to use a premade child theme. As it turns out there are a lot of child themes for Divi that either are or include portfolios. In this article I’ve taken a look at the 18 best Divi portfolio child themes. A portfolio is about story. Stories can be told or shown. There are several types of portfolios and they tell the story in different ways. They can tell the story in detailed timelines or show the story in multiple photos. A portfolio can be about a project with the problem and results, an artwork showcase, or a photoshoot. Creative agencies can show their work. Artists that sell their photography, art, etc. Child themes with both types of portfolios are included in this list. To choose child themes for this list I first looked at themes with reviews. Most child themes in the marketplaces don’t have reviews. This can make it difficult to know the best themes (if you’ve bought them please leave a review to help others make a decision). I read the comments to determine real issues from misunderstandings, such as the user not realizing they needed to unzip the file, and ranked them accordingly. Next, I sorted by sales to see what was popular. I then tested the demo of each theme and considered design and usability. I looked at the reputation of the developer and talked to as many shows as I could. If I still wasn’t sure I contacted the marketplaces for information about sales and customer feedback. All of the marketplaces responded with the information I needed and confirmed my thoughts of the themes I chose. Let’s take a look at the 18 best Divi portfolio child themes. There’re in no particular order. 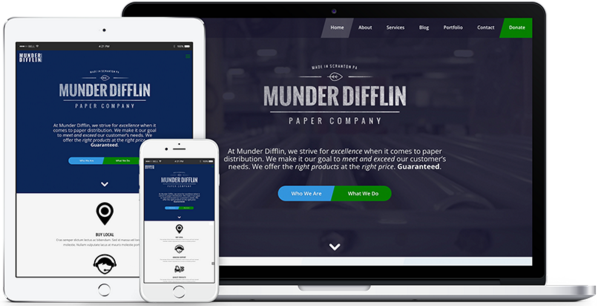 Munder Difflin is a multi-purpose business child theme with a specialized portfolio to show off your projects. It includes lots of custom layouts and modules, a transparent menu, example pages with royalty-free images, a custom footer, and custom CSS. 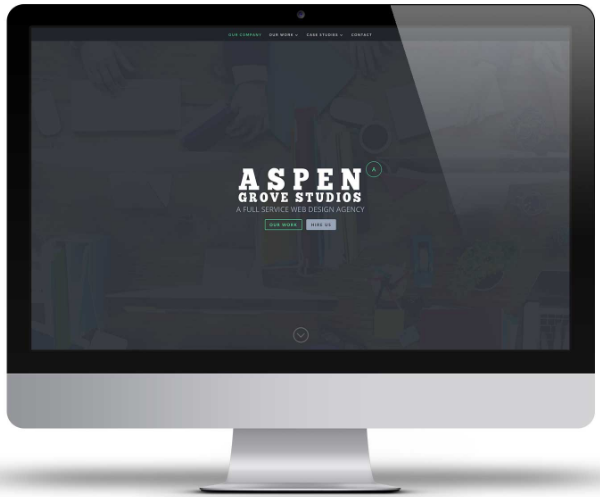 This is a great choice for any type of business website that needs to display a portfolio. 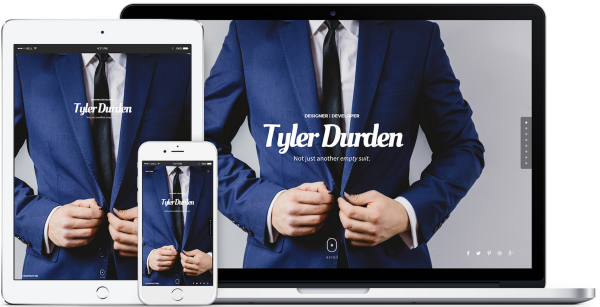 Hello is a single-page child theme for creating resume’s and portfolios. It includes a nice timeline to show your job skills and education. It also has a custom footer, header, functions.php, and CSS. Royalty-free sample images are included to help you get started. The tiled portfolio section shows off your work with images, sliders, video, blog posts, etc. It also has a custom testimonials section. This is a good choice for anyone that wants to combine a resume with a portfolio. 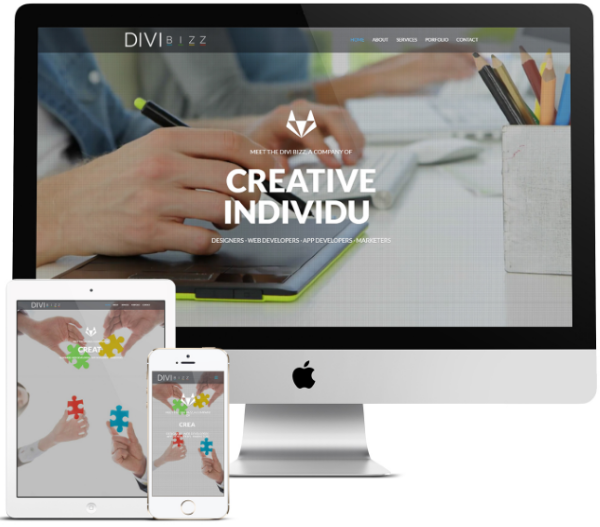 Divi Bizz is a business child theme with a specific focus on the portfolio. It includes lots of custom pages and lots of custom hover effects. The custom portfolio page has a background video, tiled portfolio with custom hover effects, and a footer with widgets and social icons. Each portfolio link takes you to a custom project page where the project is described and includes links to similar projects. This is a great choice for any type of design firm. SEO Monster was designed for any type of business that needs to showcase their work. It comes with 8 custom pages including a portfolio page and individual project pages. Use the custom testimonials page to show off what others have said about your work. It has lots of CSS animations including the menu, buttons, sidebar, and images. A custom footer includes social icons. It’s a good choice for creative agencies. 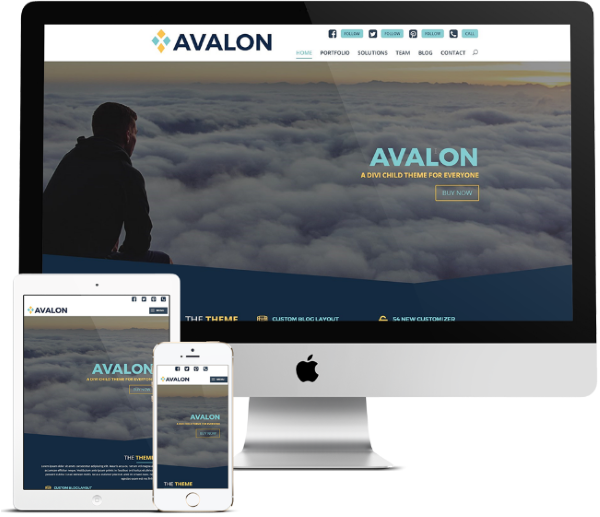 Avalon includes lots of extra theme customizations on top of the already powerful Divi platform making it among the most advanced Divi child themes available. The custom portfolio page includes case studies and filterable projects. It includes lots of customized modules. Create your own footer using the page builder in the footer area. It’s a great choice for any type of creative agency. Studio 28 is a one-page child theme that was made with creatives in mind that want to showcase their work. The portfolio uses a tiled gallery with a lightbox. Stylize your images with the included Photoshop action. It’s both simple and elegant and is an excellent choice for showing photography and artwork. 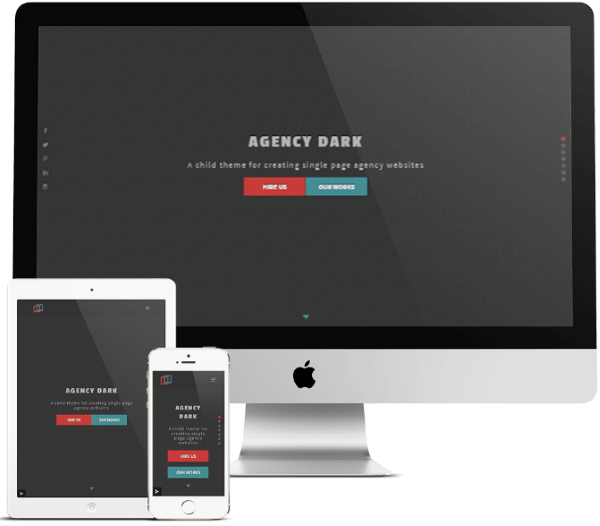 Agency Dark is a one-page child theme with a custom portfolio section to show off your work in a tiled gallery section. Image open in a lightbox. Use the custom testimonies section to show what others are saying about your work. It also includes a custom contact form and a custom call-to-action button in the menu. It provides new customizer settings for the menu call-to-action button, footer, and back to top button. It’s a good choice for any type of single-page portfolio. 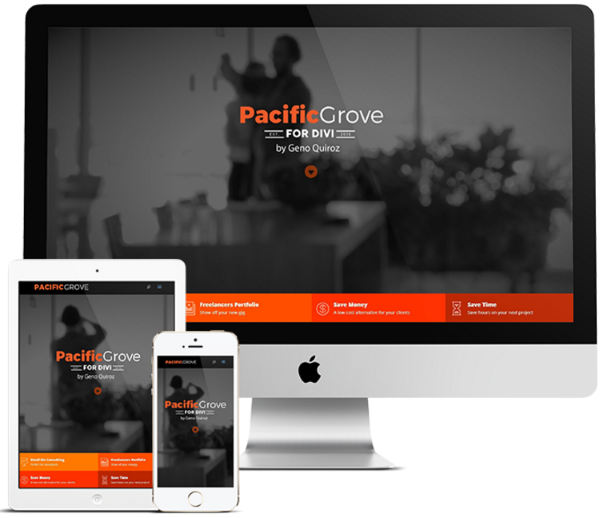 Pacific Grove is portfolio child theme that includes a filterable gallery for your projects which then lead to custom project pages that tell the story of the project. Project pages include a header, challenge / solution highlights, conclusion, bar counters, CTA, and more. It provides 9 different page templates including a single post page and an archive page. It’s a great choice for any type of creative agency. 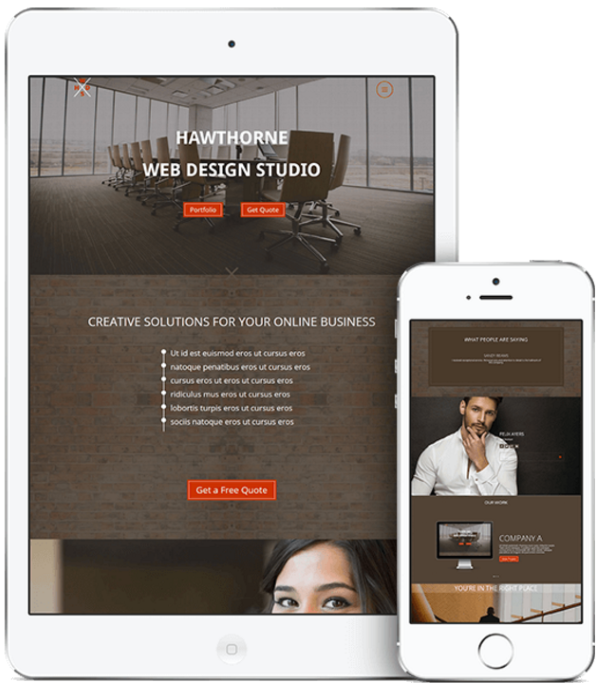 Hawthorne is a business child theme for agencies with 6 page layouts and lots of extras. The sample project page includes a hero image, description, bar counters, and a CTA. Extras include a border styled menu, border styled buttons, styling for Bloom and Monarch, Caldera contact form, a custom testimonial slider with a shadow box, a home page timeline, and more. It’s a great choice for creative agencies. 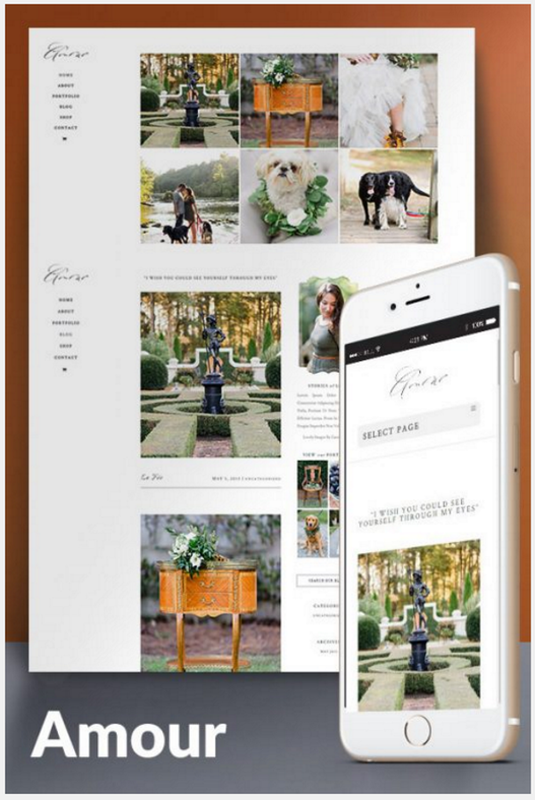 Amour is an elegant portfolio child theme with a focus on showcasing photography. It has 8 page layouts which include photo galleries. Mouse over effects show the name of the gallery. The galleries include sliders. It also has WooCommerce integration so you can set up a shop on your website. It includes the premium edition of Essential Grid plugin. It’s an excellent choice for anyone that wants to elegantly display their photography portfolio. 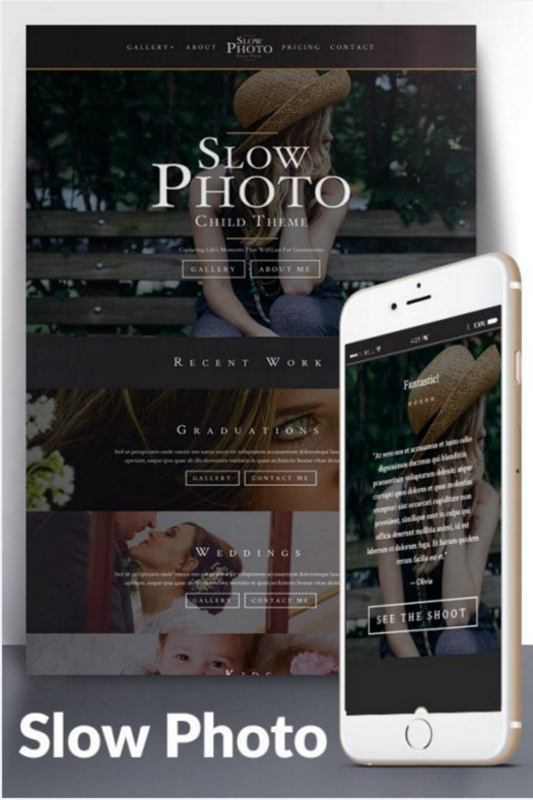 SlowPhoto is photography portfolio child theme with multiple pages and galleries. Recent work is shown on the home page and within their own galleries. Customized testimonials include a rating system. The custom portfolio page showcases the photos in a grid. They can be displayed in the lightbox. The custom header shows a center inline for desktop and default on mobile, which is unique to this theme. The typography was specially chosen to set your readers’ reading pace. Special attention was given to the social media icons to help improve social sharing. This is an excellent child theme for photographers. Case Study is a simple design that’s made specifically to showcase the details of your projects. It includes pages for each item within your portfolio and a page for each case study so you can discuss the project in greater detail and show the results. The project pages show an overview of the project while the case studies look at the project in more detail and show the design and features. They also include several hero images with CTA’s interleaved between them and bar counters to show the results of the improvements. It also includes several premium plugins from Aspen Studios. It’s a great choice for creative agencies. 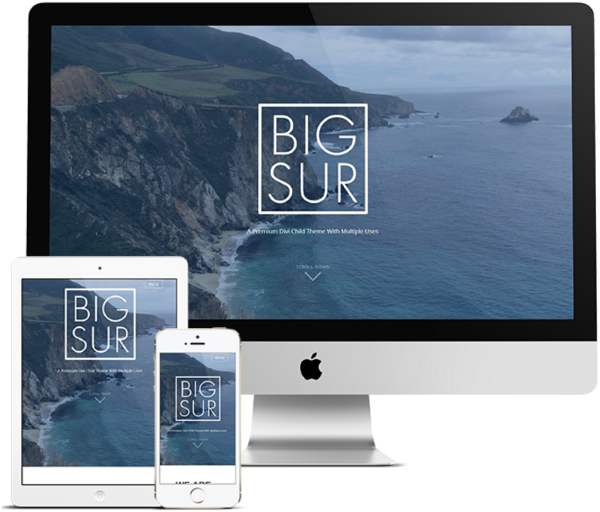 Big Sur is a multi-purpose child theme with a sharp portfolio. It’s loaded with CSS features from Geno’s tutorial blog. The portfolio page includes a gallery, slim opt-in form, custom contact form, and contact information area. The individual project pages show a short description and lists the details of the project. It’s a great choice for agencies and freelancers. One is a one-page business child theme with a blog that’s great for corporations and agencies. It includes 9 sections, a custom project page, and 6 blog styles. The portfolio section includes a clickable project gallery with titles. Clicking them takes you to individual project pages where you can provide details about the project. It’s simple but effective. 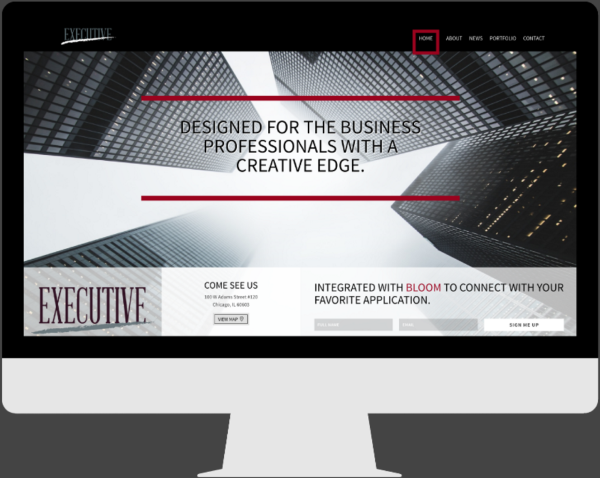 Executive is a business child theme that’s well-suited for any type of business website include corporations and creative agencies. It includes 5 custom pages with a portfolio page to show off your projects. 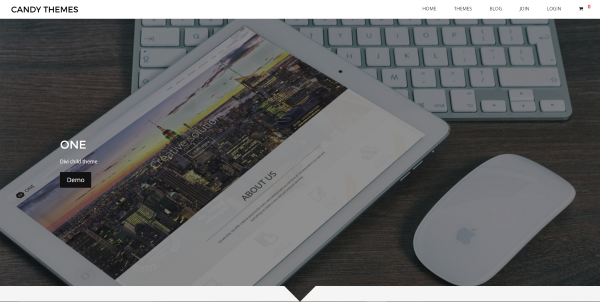 It has a uniquely customized portfolio page with a special section to highlight your contact information, a customized email opt-in form, a three-column section with a testimonial, links for project details, a project overview with skills and mediums involved, a link to the project, and a project image. Freshness was designed for freelancers and small business owners. It has a one-page design with a custom project page to showcase their projects. 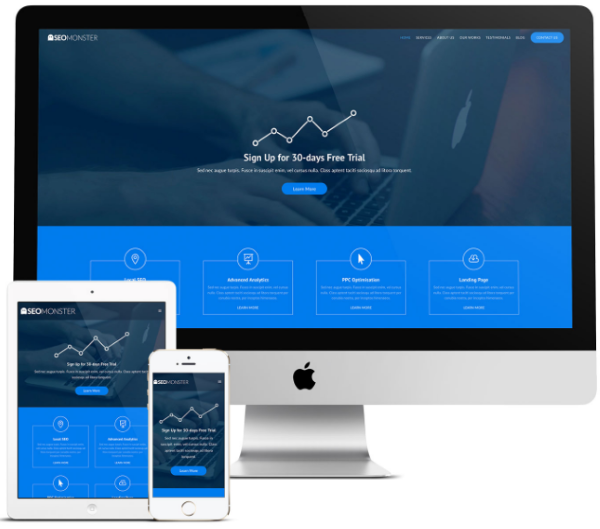 The project page is highly detailed with a CTA, stylized walkthrough of the project to tell the story of the problem and solution, and ends with a CTA and social follow icons. It use a slide-in vertical menu and has a strong focus on call to action. Skye is a photography child theme. Virtually every element has been meticulously styled to create a site that looks elegant and usable. The portfolio includes a lightbox gallery, slider gallery, and full-width gallery. Lots of page templates are included with various options for the home page and galleries. It’s an excellent choice for photographers. 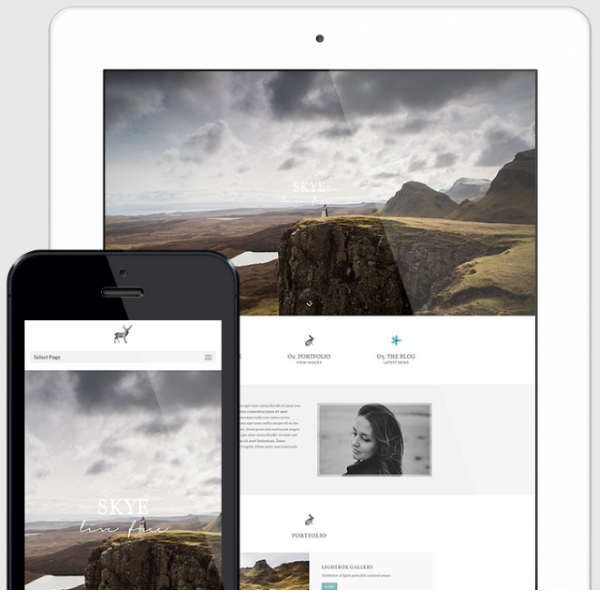 Showy is a design and photography child theme with a masonry portfolio. It includes 4 custom pages and a mobile menu for desktop. It also includes 2 custom project pages. The first includes a hero image, navigation, and 2-column and single column clickable images that show in a lightbox. The second page adds bar counters, project details, and circle counters in a masonry grid with the images. It’s a great choice to showcase photography or any type of visuals. There are many others that I liked the look of and I wanted to include them here. For anyone that wants to create a portfolio site or have a site with a portfolio Divi has plenty of child themes to choose from. 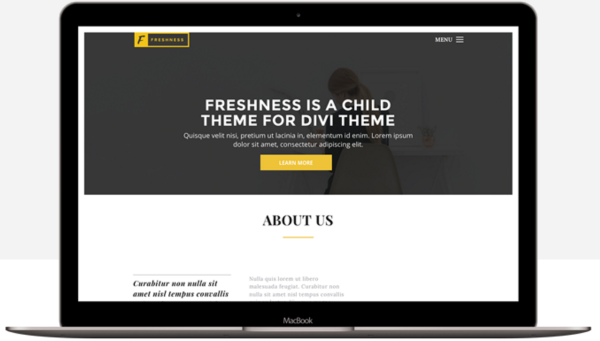 You can add a portfolio using the Divi builder, but child themes are even easier to work with because the design-work is already done for you, and Divi has a great advantage in the number of child themes that are available. With these 18 child themes there’s sure to be something to meet your portfolio needs. What do you look for in a portfolio child theme? Thank you for great article. Although I do not understand which kind of Child Theme do you mean. I am sorry if my question is mismatched. I am Divi user for 2+ years and work with Divi child theme. During this period Divi made a giant progress. I guess that if I didn’t work with child theme I have had to repeat the settings at least several times. In your article you described 18 customized one-purpose (portfolio) Divi child themes. Could you explain what is the role of these portfolio child themes? Do they compensate my general child theme if I need to present project portfolio within my webpage? Or do they work concurrently with my general child theme? I am looking forward to your explanation. Hi Irina. That’s an excellent question! These will take the place of your child theme, so they don’t work with another child theme. You would activate Divi and then upload and activate the child theme just like you do any theme. Once it’s activated you would follow the instructions provided in the child theme files to import the content that creates all of the layouts, colors, etc. Once you upload the child theme settings your website will look like the demo of the child theme (some will have placeholder images). Looking for a child theme for a client. They are a business networking group that get together for lunch once a week to share referrals. I’m think design must be able to showcase a business of the week. Do you think the child theme “Munder Difflin” will work? Is there a child theme you can recommend. This is a great resource post. Hi Rubin. I think Munder Difflin would work great for that. The home page, blog, or portfolio can be used to focus on a business of the week. Thank you for showcasing Avalon! Thanks for adding one of my Divi child themes Randy, appreciated. This is very helpful especially for those clients that “haven’t decided yet” what they would like their website to look like. Thanks for this useful article, Randy!